Saturday 14th July couldn't have been much better for flying - not too cold, not much wind, and we had a good turnout of biplanes as well as the usual Saturday morning pilots. Col Mitchell's lovely SE5A took first prize in pilot's choice, narrowly pipping David Foster with his triplane and Phil Maher with his Pitts Mamba. David Foster's Fokker picked up 4th place too, with Stuart Cohen (ultimate) and Tom Sparks (pitts) picking up a vote or two. Clive's tatty old Panic and Dave B's microscopic foam biplane didn't get a vote - par for the course. In the racing, Stuart Cohen had a tiger, as did Dave Bolstad, and Clive had finished a Scanner that morning and unseized an old Super Tigre engine that hadn't run for several years. The racing was very close (especially the first corner mayhem) and Stuart eventually pulled away to win, with Clive 2nd and Dave Bolstad going off the boil and completing his last lap inverted. Despite the small numbers it was a great race and thanks to all the callers and spotters. We had good eyes at both end pylons for this race and the pilots made a special effort to go round rather than inside the pylons - well worth doing and only one cut (whilst inverted). The 11th August is our big fun fly, fun scale, bring and buy day with another round of racing. If you haven't tried this yet, how about getting your local hobby shop to grab you a Scanner or a Tiger, bung in a 46 glow and give it a go? 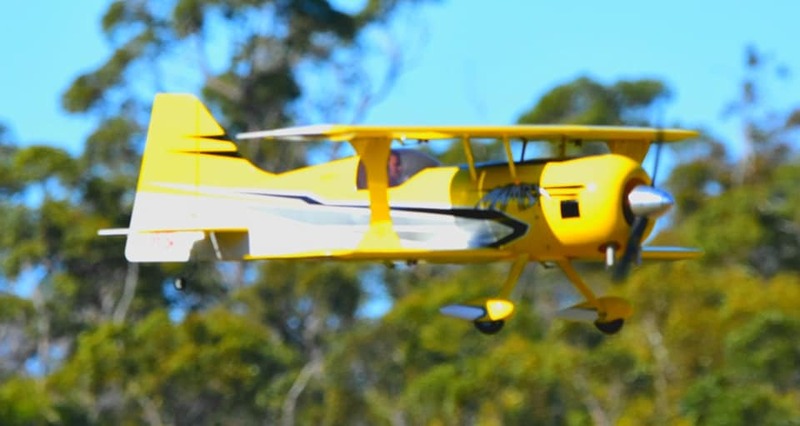 They are both excellent sport planes for everyday flying, and at about $160 for the Scanner, it isn't exactly expensive racing. You'll be competitive just by turning up with a plane fitted with an engine and the right propeller (APC 11x6 only). Standard 10% nitro fuel. It's not tough to fly the 10 lap course and a great way to sharpen your focus on smooth flying and accurate turning - which is most of what you need to do to place well.